Is it just me or is your fridge full of half-used "stuff"? Half a jar of this sauce, half a bottle of that condiment, etc. It makes me nuts. Not nuts enough to be efficient and use them up, instead I often end up chucking jars that seem to have gone from good to questionable... but hey, nobody's perfect, 'm I right? Growing up my favorite meal was ravioli with sauce. It's still pretty high up there but these days I tend to find it a bit boring. I threw this lil' number together in an effort to use up some of my half-used things (tomatoes and alfredo in this case) and mmmm was it a success. Landon, who eats approximately 1 food, said, "That smells DELICIOUS!" (He didn't taste it- but hey, we can't win them all...) Such an easy meal and it's so so yummy. 1- Preheat the oven to 350. 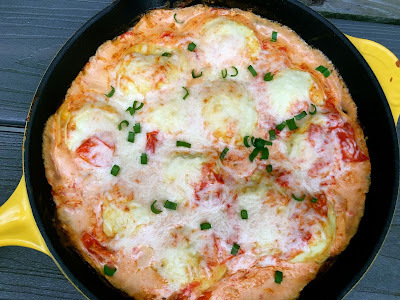 2- Place tomatoes in an oven-safe skillet. Drizzle oil over the top and set in the oven for about 25 minutes, until the tomatoes skin begins to wrinkle and the juices begin to run out. 3- Meanwhile, cook your ravioli according to package directions. 4- Using a potato masher mash the tomatoes, releasing their juices into the skillet. 5- Stir in the alfredo and the garlic salt, stir well. 6- Gently fold the ravioli into the sauce. 7- Top with the shredded mozzarella. Return to the oven for approximately 15 minutes, until the cheese melts and the sauce bubbles. Looking delicious to me and ingredients are also healthy, can’t wait to eat this delicious food anymore as I am feeling hunger.